Welcome to the website of New World Cinema, my production company. Here you can find out the latest news as well as read my articles on film. We've finally finished filming my debut feature film, The Here And Now , and I'm looking forward to showcasing my wonderful cast and crew. I've also been helping out on another very exciting independent production (and another feature-length directorial debut), and this forms my editorial below. Amidst all this excitement, I've had time to write a piece about the splendid new film from Bill Morrison, Dawson City: Frozen Time, and you can read that in the DVDs section of this website. I feel honoured to have been a part of a new feature film which finished shooting in the last week. 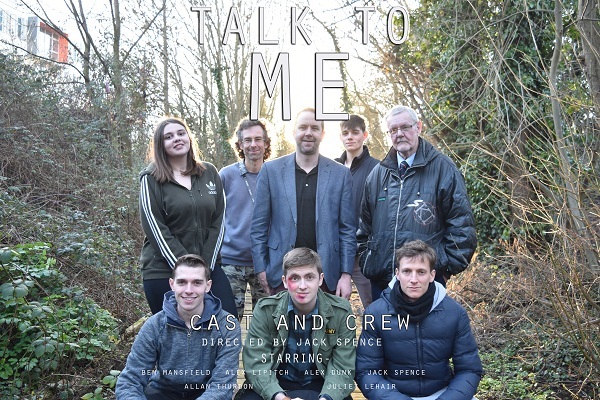 Talk To Me tackles a number of sensitive and emotionally-charged topics, so it's all the more remarkable that its writer and director, Jack Spence (lower left), is still only 18. He also ended up taking up one of the central roles when one of the actors was forced to pull out at the eleventh hour, making his achievement all the greater. Oh yes, and he shot AND edited the film himself...in just four days. Having seen a rough cut of the finished product, I feel extremely proud to have been involved. Not only was it colossal fun to be on set, the finished film has depth, style and beauty which are exactly what the British film industry needs. Forget trying to emulate Hollywood- original films like this are the real deal. So, look out for the film Talk To Me in the press, and, if you get the chance to see it, I'd recommend that you do so. As for the multi-talented Jack Spence, he is definitely one to watch. More of my own experimental work to come this year- hopefully meaning more film festivals and more coverage. I'm determined to write more short stories this year! All reviews/articles are copyright © Richard Harrison 2008-2019 and must not be reproduced in any way without prior consultation with the author.